War marked Canadian history and life in the first half of the 20th century. When it began, Canadian troops were fighting for the British empire in South Africa. Two French Canadians, both Liberals, Sir Wilfrid Laurier for the South African or Boer War and Louis-Stephen St-Laurent for the Korean War, made the decision to send Canadians overseas to advance Canadian interests and values. Two English Canadians, the Conservative Sir Robert Laird Borden and the Liberal William Lyon Mackenzie King, made commitments to much larger struggles in 1914 and 1939. Their decisions significantly affected not only the outcomes of the First World War and the Second World War but also the political, social, and economic fates of their country. In the two conflicts almost 1.8 million men and women served, and over 100,000 died: the impact on Canada was huge. Borden and King seem unlikely wartime leaders, lacking the bulldog tenacity of Sir Winston Churchill or the inspiring oratory of Franklin D. Roosevelt. Whereas Churchill had served in battle and Roosevelt was fascinated with the navy, neither Borden nor King had ever been in arms, and they demonstrated little interest in military traditions and history. The two were not warlords in any usual sense, but they managed to guide their nation through, perhaps, its most difficult trials. Borden had been prime minister for three years when the First World War began in August 1914. He had no hesitation in committing Canada, then a colony, to fight for the British empire, yet as the war went on he believed with increasing conviction that the nation must have a stronger voice in decisions of policy and military action. He held that the country’s honour and his own were undergoing their greatest test on the battlefields of western Europe. 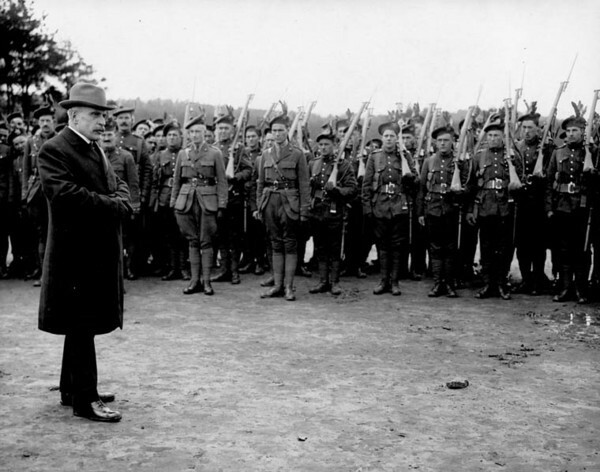 Facing an election in 1917 while Canadian soldiers were enduring heavy losses, he turned to conscription and a coalition with English Liberals who were willing to support a Union government. This contest profoundly divided Canadians and created lasting bitterness, particularly between anti-conscriptionist French Canadians and the English Canadians who backed the Union government. With his victory at the polls, the prime minister believed he had kept faith with his troops. But the memories of the 1917 campaign haunted the Conservatives in the decades that followed and, perhaps more than any other event, made the Liberals dominant in federal politics for several generations. A cautious leader, King looked back at Borden’s dilemma as he plotted the course for his government and his country through the Second World War. Recalling the terrible death tolls in the army during the first conflict, King tried to emphasize air service, economic aid, and logistical support. Knowing the political costs of conscription for Borden, he equivocated, delayed, and finally agreed to a late and limited policy of conscription, signed into being in November 1944. Both men and their colleagues were exhausted by the demands of total war. Unlike Churchill and Roosevelt, Borden and King remained their nation’s leader in the peace that followed. In their introduction to Canada’s prime ministers: Macdonald to Trudeau, Réal Bélanger, directeur général adjoint, and Ramsay Cook, former General Editor, note that the “entanglement of national interest/unity and personal/party interest” has challenged many Canadian prime ministers. They suggest that those who are most successful manage to maintain “a careful balance that skilfully links personal ambition with party goals and wraps both in the flag.” By this criterion, neither Borden nor King was fully successful. Yet both steered a deeply divided country along an arduous course in truly difficult times.